John Hodgman has made his living off of telling tales and giving people orders. His first three books, satirical almanacs, cover topics ranging from fake historical anecdotes to the validity of the upcoming Mayan apocalypse. I first came across Hodgman through his podcast, Judge John Hodgman, where he mediates everyday conflicts with a self-righteous demeanor and certain unfailing rules, like that everyone should learn to drive a car with a manual transmission and living together before marriage is not sinful but is a major financial liability. 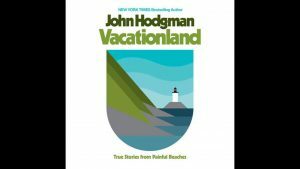 John Hodgman presides, and so I wasn’t surprised when a chapter of his collection of essays, Vacationland: True Stories from Painful Beaches, began with a declaration: “I don’t like riding on city buses. Those things can go anywhere. There are no tracks, and their routes and stops are a collective fiction. What if something goes wrong?” (To be clear, I agree completely with Hodgman’s distaste for the bus. I once got on a bus thinking I’d end up at work and instead found myself being stared down by security inside a U.S. Naval Warfare Center). 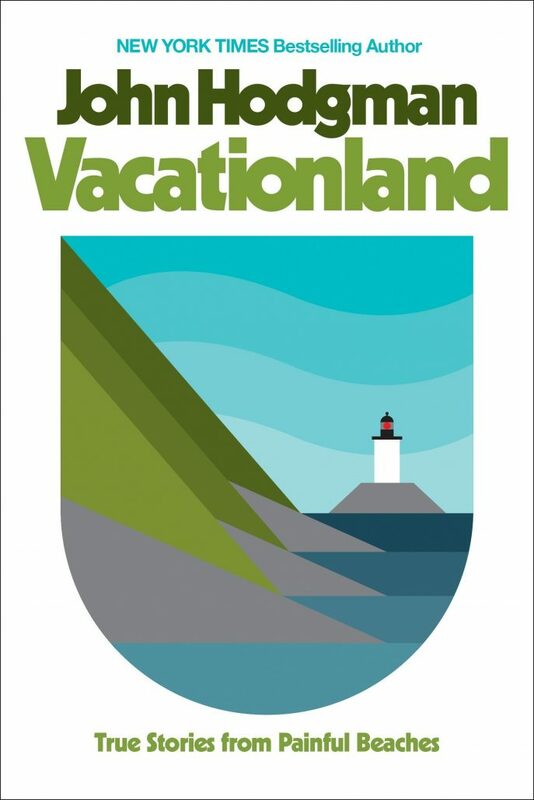 I expected that eccentric tone when I picked up Vacationland, knowing full well that Hodgman is a self-proclaimed narcissist. What I wasn’t anticipating was that the book would also be moving and filled with not just self-deprecation but intimate self-reflection. Hodgman enters the page center stage with a promise: “I will be honest with you: there are no fun fake facts in this book. While I may evade particular details and change some names in order to protect the privacy of those who did not ask to know me, the rest is all the awful truth about my dumb thoughts and feelings. I am sorry for this. It is all I have left.” And indeed, Vacationland feels like a direct rebuke of the current political climate. No fake facts, no alternative truths, just the truth, the whole truth, and nothing but the truth–it’s appropriate for a judge, even one of the internet variety. 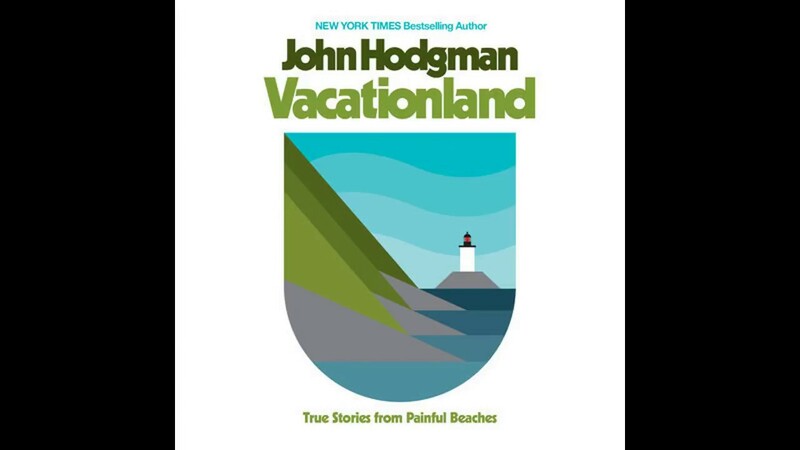 Among the most powerful essays in Vacationland is “Rocks on Top of Other Rocks” where Hodgman and his best friend go swimming in a swimming hole that is semi-legal by the laws of the United States government and build cairns, which Hodgman fears is even less legal according to the cairn police. He battles his own reservations and confronts his instinctive desire to be a genius in everything—even if that thing is as simple as piling rocks on top of other rocks. And because Hodgman has promised to be truthful, he finally admits what we the audience have suspected: he and his friend have been high the whole time. This delayed glimpse of honesty is exactly what keeps us readers on our toes, certain that Hodgman won’t lie to us but also wary of what tricks he might pull on the next page. The essay is hilarious, sharp, and ultimately an indication of all the ways in which the book is successful: even through the littlest experiences, Hodgman is able to capture powerful insights. But that’s how Vacationland functions—through a series of laughably innocuous moments like taking trash to the dump or visiting Perry’s Nut House, a little shop in Maine without a bathroom. Hodgman ruminates on the big questions and exposes his insecurities in the funniest way he can. Hodgman is one of those rare people that can make a truly smart joke out of basically anything, one of those people that all the rest of us want to sit and listen to for hours at a time, and in Vacationland he invites us in for tea – or for a scotch maybe. Hodgman is first and foremost a comedian, and this book is first and foremost comedic; nevertheless, he is able to reflect on his past while also being forthright about his ridiculous privilege; the impetus for the book, he admits, is that he owns two summer homes and doesn’t know what to do about it. He takes the time to speak directly to the issues weighing on him – on all of us – without feeling the need to tackle it with humor. He states, “Yes, I shoplifted some off-brand beers and snuck into the London Zoo when I was in my twenties; but only now do I realize that I did so with full, if unconscious, confidence that I would not be executed in the street for doing these things.” These moments of solemnity are startling and powerful and likely give away a little more of John Hodgman than he would typically let us see. John Hodgman’s Vacationland is a perfect example of the way white male voices can and should respond to modern day tumult, socially, politically, and personally. I very rarely put down a book and think, more boys should read this, but that is my hope for John Hodgman and his book about owning two summer homes. He writes about growing up, finding his place in the world, raising children, and losing family with a poignant voice and a large helping of clever comedy; the book doesn’t feel like an instruction manual on how you are meant to act, but something about Hodgman makes you want to follow in his footsteps. John Hodgman isn’t the voice of a generation, but he’s a beautiful example of how to take a step back and listen to those who are.